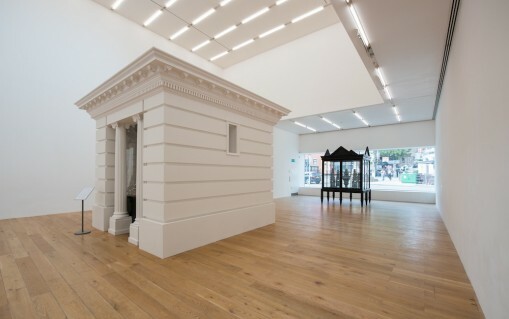 As part of The Grand Tour, a Nottinghamshire and Derbyshire initiative connecting historic collections with contemporary art, the artist Pablo Bronstein has brought some Chatsworth House bling to the white cube gallery spaces of Nottingham Contemporary. Wayne Burrows finds out why. It seems appropriate that the cultural tourism initiative of The Grand Tour, a new programme of exhibitions and events connecting three historic collections with contemporary artworks, new technology and knowledge, should be a Derbyshire and Nottinghamshire initiative. After all, the region was responsible for some of the most renowned Grand Tourists of the 17th and 18th centuries, notably Lord Byron, whose former home at Newstead Abbey hosts an exhibition of textiles and exploratory walks by the artist Alison Lloyd as part of The Grand Tour’s fringe programme. 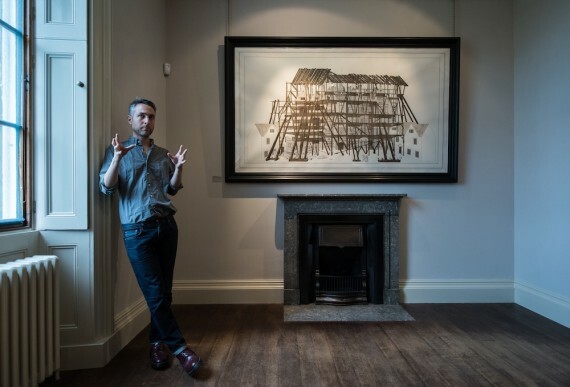 Alongside exhibitions at The Harley Gallery on the Welbeck Estate, Derby Museum and Art Gallery, and QUAD Gallery, the centrepiece of The Grand Tour is undoubtedly the Argentina-born, Neasden-raised artist Pablo Bronstein’s exhibition. 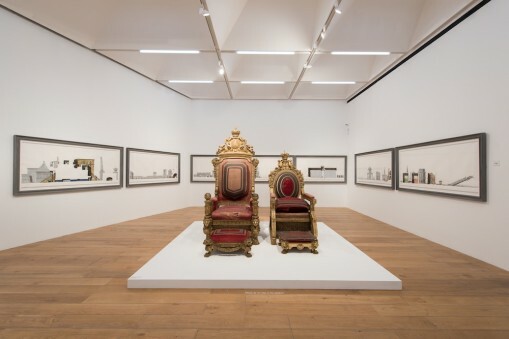 Through a series of staged interventions, his show connects the lavish Baroque architecture of Chatsworth House with the gallery spaces of Nottingham Contemporary. At Chatsworth itself a retrospective of drawings by Bronstein is on view alongside the Old Masters, while at Nottingham Contemporary the largest loan of works from the Devonshire Collection in more than 30 years has taken up slightly incongruous residence. The result might have been an exercise in contrast, between the functional white cube gallery and the highly decorated aristocratic stately home. Bronstein, however, sees the relationship in a rather different way. Best known for his highly-crafted drawings, prints and installations inspired by a part-real, part-imaginary version of the European Baroque and Neoclassical past, Bronstein’s own works accompany the displays of silverware, furniture, sculpture, 16th century ‘flower pyramid’ ceramics and Old Master drawings from Chatsworth’s collections. They also re-frame his chosen objects in ways that make them seem like extensions of his own, self-confessedly ‘perverse’ practice, gleefully inflected with the high artifice of 1980s post-modernism. Walking through the four galleries at Nottingham Contemporary, the rooms vary a great deal in their staging of Chatsworth’s treasures. In one room, silverware and Delft ceramics are arranged in deliberately skewed, fake-historical cabinets. Silver tureens, plates and candelabras by such Regency craftsmen as Paul Storr and Robert Garrard reflect to infinity inside a Neoclassical temple (or possibly a tomb) with a mirrored interior: a vista of power and wealth replicating itself, perhaps. In another room, digital architectural renderings of Chatsworth House float on the deep-blue painted walls like a space station, stripped of its 19th century extensions to reveal the original Baroque structure commissioned by the First Duke, William Cavendish, in the 1600s. 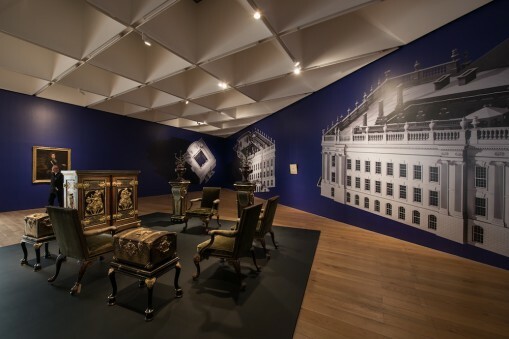 The hollow square enclosing a forecourt echoes our own path through the four galleries of Bronstein’s exhibition, and frames a display of ornately decorated furniture with plain wooden backs, as though exposing the façades of an elaborate stage set. The Grand Tour initiative may be essentially an exercise in rebranding Nottinghamshire and Derbyshire for the purpose of encouraging cultural and heritage tourism over the summer, but this hasn’t led to its commissioning being overly reverential. That, after all, would not have been in the adventurous spirit of the original Grand Tourists, who spent vast amounts of time and money over three centuries roaming the great sites of European antiquity – from Vesuvius to Athens, Geneva and Venice to Rome – in an attempt to reinvent reason and enlightenment from the traces of the ancient past. The Harley Gallery on the Welbeck Estate, once the home of famed seventeenth century author and collector Margaret Cavendish, hosts an exhibition by Rem Koolhaas originally shown at the 2014 Venice Architecture Biennale. The show is a gathering of films and photographs made in response to the mysterious tunnels and vast underground rooms created by another former Welbeck Estate resident, the notoriously eccentric 5th Duke of Portland. Derby Museum and Art Gallery offer insights into the restoration process of two Grand Tour paintings by Joseph Wright, The Colosseum By Moonlight and The Colosseum by Daylight (1789), both on public view for the first time in 200 years alongside the gallery’s world-renowned permanent collection of Wright’s paintings and artefacts. By way of contrast, a short walk away, QUAD Gallery hosts Benedict Drew’s Kaput, an installation of kinetic sculpture, film and sound that explores notions of enlightenment through sensory overload in ways that Joseph Wright might have struggled to comprehend. For Bronstein, the historical context of The Grand Tour initiative relates very much to his own interest in the traditions of the past. Not, he stresses, that this makes him in any way conventional or old-fashioned. “I sometimes get labelled a conservative,” he says, “but that’s usually said by people as they walk past million-dollar abstract paintings made by 23-year-olds, or very bad, supposedly transgressive videos in hugely endowed private institutions.